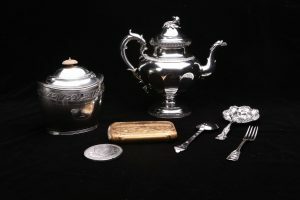 Group image of several artifacts included in the exhibition: a tea caddy, teapot, gold cigar case, commemorative medallion, and several examples of flatware. These roots of Commodore Vanderbilt himself paved the way for a tradition of using silver to mark important ceremonies and award recipients at the university. 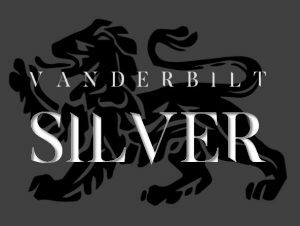 The selection of silver on display draws up memorable moments in the university’s history, aims to introduce the vast art of silver making, and in many cases, comes to us directly from the Vanderbilt family. Exhibition curator Molly Dohrmann met with local silver experts to identify hallmarks and makers’ marks, date the pieces and research their history, do a bit of polishing and buffing, and to literally track down silver pieces from across campus and beyond. The result is a dazzling array of different types of silver – with varying purposes, time periods, and countries of origin. 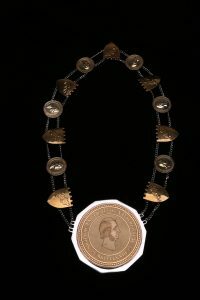 Among these are the university’s mace and Chancellor’s chain of office, both pieces of ceremonial gilded silver used at commencement activities every year, and designed in consultation with Robert McGaw in 1969 and 1978 respectively. The mace was designed and made from rosewood and gold-plated silver by Norah Creswick, artist jeweler of Edinburgh, Scotland and embellished with embattled shields, irises, magnolias, oak leaves and acorns. Visitors to the exhibition will see a variety of flatware from the Vanderbilt family, who lavishly entertained guests at their mansions. 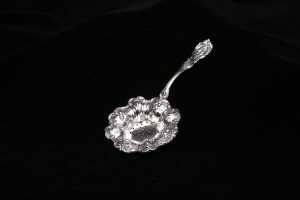 Among the hundreds of silver items in the family’s butler pantries were turtle forks, oyster spoons, butter picks, tomato servers, and demitasse spoons. An ornate tea strainer in the Francis I pattern by American silversmiths Reed and Barton, and a large serving spoon by the renowned British silversmith Paul Storr are among the objects on display. A tea service given to the Holland Nimmons McTyeire family is also on exhibit. Engraved on all pieces of this set are the words: “Amelia McTyeire from the Methodists of New Orleans, 1858,” a fitting tribute to her for all of her efforts on behalf of the city of New Orleans, where her family lived before coming to Nashville. 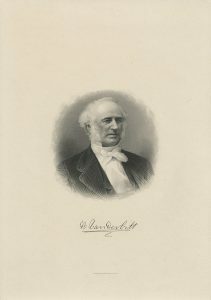 In the early 1870’s, Amelia McTyeire and her cousin Frank Armstrong Crawford Vanderbilt, second wife of Cornelius Vanderbilt, would introduce their husbands to each other and the result would be a gift from Commodore Vanderbilt for the founding of what would become Vanderbilt University. Please visit us in the Special Collections Library to see these treasures and more, on display through November 11, 2018. The library is open from 8:00am-4:30pm, Monday through Friday.